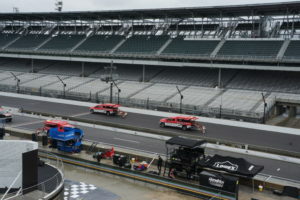 The only vehicles on the track when the Brickyard 400 was supposed to begin were the Air Titan track-drying trucks, creeping around the soaked Indianapolis Motor Speedway at 3-5 mph in what became a futile effort to make the track ready for the last race in NASCAR’s regular season. But intensifying drizzle by mid-afternoon forced cancellation of the race until Monday afternoon. The green flag is to drop shortly after 1 p.m., CST. Cars had been rolled out to the pits for opening ceremonies despite the steady deterioration of conditions. By mid-afternoon, however, the car of Joplin’s Jamie McMurray had been taken back inside. The weather forecast for Monday afternoon is for cool but dry weather. Because practice and qualifying were rained out, the starting field will be based on point standings, meaning McMurray will be buried in mid-field at the start. He thinks, however, that some tire testing at the track earlier this year might give him an edge. But he expects some early competition caution periods so steams can measure tire wear. He talked about those things with us and other reporters and also touched on liking the city and the track, his need to win to make the playoffs for the fourth straight year, and the planned folding at the end of the season of the defending championship team, Furniture Row Racing, because of lack of sponsorship for 2019. 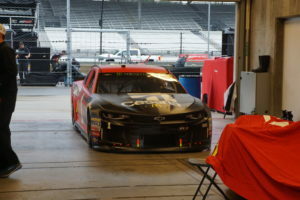 Clint Bowyer’s car also spent the rest of the afternoon in the garage instead of on the track.. He’ll start on the inside of the fourth row as he looks for his third win of the year, his first at Indianapolis. Bowyer has locked himself into the playoffs with two earlier-season wins. The race will be without defending champion Kasey Kahne, who is suffering from heat exhaustion problems and was particularly affected last weekend at Darlington. Kahn announced earlier that this would be his last year as a fulltime Cup driver. Two drivers will start from the back of the pack. Defending points champion Martin Truex Jr., and Daniel Suarez, who would have started 20th, are being penalized because their cars failed pre-race inspections—Truex’s car three times and Suarez’s car four times. Sonoma Road Course. Formula One moves on to Shanghai for its next grand prix.